I first saw Rouge around 1990, when there was a sudden upsurge of interest in Hong Kong cinema in England. Just as Ring and Battle Royale drew the world’s attention to Japan, the films of Jackie Chan and Tsui Hark started to appear in art cinemas and even on TV – causing a flurry of interest in Hong Kong fantasy and action films. At the time, I was lucky enough to see Tsui Hark’s Zu Warriors of the Magic Mountain and The Heroic Trio on a big screen, and Channel 4 ran an important season of Chinese Ghost stories over a couple of Christmases. Among them was Rouge, a gentle ghost story – no blood, no screaming skulls, but an unforgettable quality film from a country that I’d formerly only expected badly dubbed Kung Fu films from. 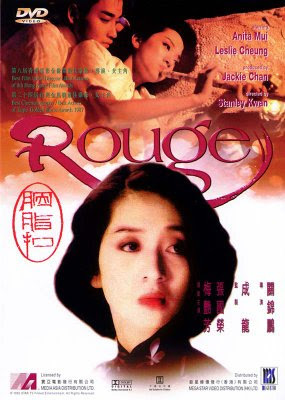 Coincidentally perhaps, Rouge was also the name of the first dramatic Cantonese feature film ever filmed, back in 1924. Director Stanley Kwan is keen to contrast the two time-frames, the guilty pleasures of 1934 with todays sexual freedoms. He carefully recreates a sumptuous atmosphere for old Hong Kong, betraying a sense of loss for the style and etiquette of the period. Then suddenly, we’re in modern day Hong Kong (well, 1987) and Fleur is now a ghost, waiting in limbo, trying to find her lost love. She meets a pair of journalists when she tries to place an ad in the paper. They learn about her life, and she learns about how Hong Kong has changed over fifty years. Then we learn more about her tragic love story, and the bargain she made with Chan. Anita Mui is ethereal as Fleur as a ghost, as well as convincing us she used to be the a sought-after concubine, despite the actress’ unconventional beauty. The film has since become all the more poignant by the tragic deaths of both actors who played the star-crossed lovers. Anita Mui had mastered every type of role – as a stunt-heavy stooge in Jackie Chan movies, performing wire-work with grace in The Heroic Trio (alongside Maggie Cheung and Michelle Yeoh), and even broad physical comedy as the two sisters in Saviour of the Soul (opposite Andrew Lau). She was also a hugely popular singer, like Leslie Cheung. 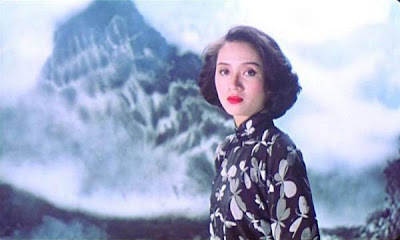 Leslie, who plays her lover Chan, also excelled in the wide range of typical Hong Kong roles, starring in everything from high-flying period fantasy in A Chinese Ghost Story (1987) and it’s sequel, through gangster dramas like A Better Tomorrow (with Chow Yun Fat), to arthouse cinema like Farewell My Concubine. He also dared to make controversial low-budget independent movies, like Happy Together (for Wong Kar Wai). Almost as beautiful as Anita Mui, they make a perfectly matched handsome couple on screen. Rouge is clever and involving, tragic and dramatic – a very unusual Chinese ghost story. 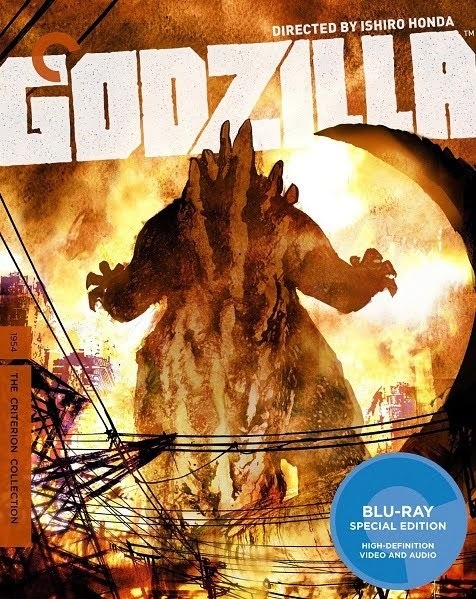 Though it’s not on DVD in the US or UK, there are several editions out around Asia. I got the HK Contemporary Collection remastered edition from Fortune Star in South Korea, which has beautiful picture quality and DTS sound, but the aspect ratio is inexplicably cropped at the top, often obscuring the tops of actors heads! I want to see faces, not feet! It doesn’t spoil the action too much, but it’s hardly considerate framing. There are good English subtitles, except for a couple of instances of signs and headlines not being translated. 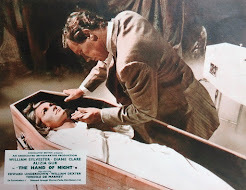 There’s also a small book full of colour photographs from the film, some looking like blurry frame blow-ups. You can see more images from the film, here on Hong Kong Cinemagic. Channel 4's series of movies, 'Chinese Ghost Stories' was absolutely brilliant. I remember 'Mr Vampire' but I don't remember what the others were -please help!! I would love to watch these movies again but it was just so long ago, I can't remember what they were called!! Apart from introducing ROUGE and MR VAMPIRE to UK audiences, I remember there was also A CHINESE GHOST STORY, CHINESE GHOST STORY 2, and the eye-boggling ZU WARRIORS OF THE MAGIC MOUNTAIN. There were several Christmas/Chinese seasons - there were also more Tsui Hark movies, like THE BUTTERFLY MURDERS. Tsui Hark has since remade ZU WARRIORS as LEGEND OF ZU (also recommended), and there's also an animated version of CHINESE GHOST STORY out there, so be careful which version you get - it might not be the 80s version you saw on Channel 4. 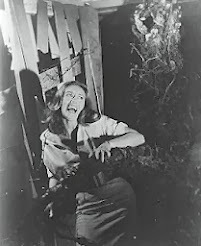 There are numerous sequels to MR VAMPIRE too, but none as good as the first. Another film which they showed was Encounters of the Spooky Kind with Sammo Hung. But they did show a few other films which were more 'modern' and I'd like to see them again! Can anyone recommended a good place to get these movies since Hong Kong Legends is no more - I have seen some on Ebay, but the more obscure ones are hard to get?